The BBQ Concepts quality and product guarantee, we price match with competitors and guarantee the lowest prices. When you choose the professionals here at BBQ Concepts, you’re choosing a local Southern Nevada company that understands the importance of quality customer service and high performance outdoor kitchen products. We’re your friend in the outdoor kitchen industry. Give us a call today to schedule an on-site design consultation. This article will help to get you familiarized with the process of building a custom outdoor kitchen. Half the battle is figuring out what you want in an outdoor living area. The first step is understanding what’s available to you. There are a lot of choices when building a brand-new BBQ Island. Choices will be made for the layout, grill, stainless-steel components, along with the finishing materials. Deciding to build the outdoor kitchen is only the beginning. The nice thing is that you have a friend in the industry, BBQ Concepts of Las Vegas, Nevada. We’re your professional outdoor living consultants and manufacturers. Whether you’re looking to get a head start on a DIY (Do-It-Yourself) project or you’re interested in having us design & manufacture it for you. BBQ Concepts is one of Southern Nevada’s newest custom outdoor kitchen builders. Below, we’ll introduce you to the BBQ Concepts design process. Our objective is to help you start thinking about your project. Here in Las Vegas, the chances are high that you’ll be building it in your backyard. Figuring out where you’re going to build your new barbecue island, the layout configuration, and what type of foundation it will be built on is a great place to start. 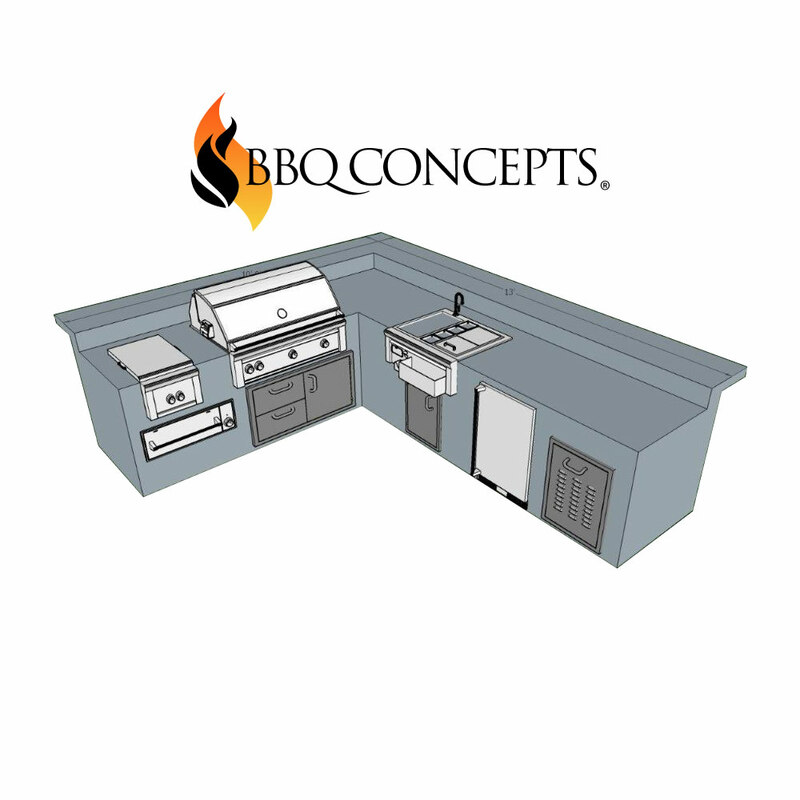 At this point you’ll probably want to contact us here at BBQ Concepts to schedule an on-site consultation. We’ll happily stop by and guide through the process of finding the perfect area for your outdoor kitchen. We’ll usually try to find a spot that has an existing foundation. If you don’t have a foundation, we’ll refer you to some great contractors that’ll help you out. During our consult, we’ll be taking measurements and figuring out whether you’ll use LP (Liquid Propane) or NG (Natural Gas) from your home. All in all, we’re there to assess both the environment as well as get some introductory decisions made. Next, we move into the fun part. Now we’ll take you through the BBQ Concepts custom outdoor kitchen design phase. Are you interested in receiving outdoor living design ideas and tips? Subscribe to our RSS feed to receive the latest in custom outdoor kitchen news and information. When it comes to the latest in technology, our team is cutting edge. We truly embrace modern design & construction technique. From the materials used in our custom outdoor kitchen manufacturing process to the way we present our project portfolios. BBQ Concepts is a modern outdoor kitchen design studio. We use the latest in CAD (Computer Aided Design) on all our professional outdoor living projects. Our process is streamlined and has been developed through many years of professional outdoor construction experience. We develop 3D CAD designs for all our outdoor kitchen projects. Enabling our customers to visualize their custom outdoor living project in the form of 3D CAD Design, all before we start to manufacture anything. Allowing you to see the proposed outdoor living space, make modifications, additions, and subtractions based on your aesthetic preferences. When you choose the BBQ Concepts team, you’re choosing the right manufacturer for your custom outdoor living space. See what people are saying about BBQ Concepts of Las Vegas, Nevada. Visit our official Facebook profile to see what our customers think about us.